Tashkent's Museum of Railway Engineering is a very cool, open air museum. Its appeal reaches beyond trainspotters' obsessions: it is here, among these huge locomotives, that the scale of the Soviet Union's empire is palpable. These behemoths plied across Central Asia from the Caspian Sea to the borders of China. 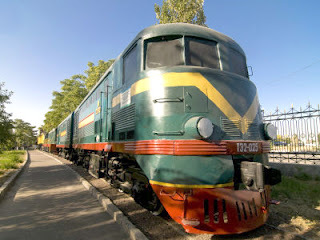 Located not far from Tashkent's main station, the museum was opened in 1989 in honour of the trunk railway centenary in Uzbekistan. The collection is one of the largest in the world: there are 13 steam engines, 18 diesel and 3 electrical locomotives as well as carriages and cars. And you can climb all over them. The 'Tsar's Carriage' is a sleeper carriage of Nikolai II's era. It is full of exhibits that tell the fascinating tale of the development and history of Central Asian railways, including images of Mrs. Bashorat Mirboboeva, Uzbekistan's first woman train driver. The oldest steam locomotive is the 'OB', nicknamed 'The Lamb' by railway workers, because of its accommodating nature. It weighed 53 tonnes and could travel at 55 km/hr. It appeared in many films, including Neulovimye Mstiteli (The Elusive Avenger), a Soviet children's propaganda film. 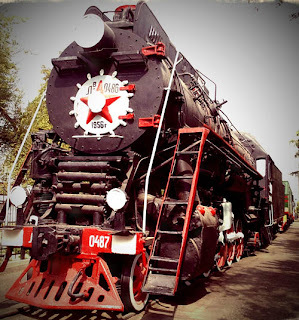 Another marvellous exhibit at Tashkent's railway museum. 'The Victory', pride of the Soviet steam locomotives produced from 1949-1956, is staggering: 178 tonnes, 5.1 metres high with wheel diameters of 1.85 metres and capable of speeds up to 125 km/hr. Another steam locomotive is the TE5-200, which was captured from the Fascists in 1943 and then put to use in Uzbekistan. Diesel and electrical locomotives gradually replaced steam: the huge TEP-70 of 1973 weighed 126 tonnes and could reach up to 175 km/hr. Soviet history also resonates in the names of these machines: the BL-Vladimir Lenin and the FD-20, for Felix Dzerjinski, a communist revolutionary hero who became the first director of Cheka, the Bolshevik's secret police. The museum is open daily from 9:00 a.m. - 6:00 p.m., however, the Tsar's carriage with railway artifacts is closed on Mondays and Tuesdays. Entrance fee is 1,000 soums per adult (about 60 cents). The telephone number is +998712997040. A two-carriage sight-seeing train on the mini-diesel TU 7-A locomotive runs through the park to the delight of visitors, especially children. You can view more images of the trains in the museum at the International Steam pages website. Update July 2012: When I visited in April, the Tsar's carriage was no longer open. Tatiana, a former train conductor, is available for guided tours if you speak Russian, French or you are with a guide. This is definitely worth doing as Tatiana brings alive the museum displays. Source materials: Thanks to Marat Akhmedjanov, publisher of Discovery Central Asia Travel Magazine, for permission to use materials from a 2007 article. Mr. Akhmedjanov also runs the Discovery Bookshop, the largest online source for books, maps, DVDs etc about Central Asia. It's a fabulous resource and I regularly buy titles there.